Welcome to the well section of the Boston Groundwater Trust website. As part of its charge to re-establish and maintain a system for monitoring groundwater levels in parts of the City of Boston, the Boston Groundwater Trust is making available data on groundwater level as shown on the map and accompanying charts. You can access data on a particular groundwater observation well by clicking directly on the well location on the map or by entering the address in the box located above the map. After reading the information below and agreeing to the terms, you will see the links to our interactive maps. In addition to our map for personal computers, we now have a map that has been optimized for tablet computers and smartphones. Select the appropriate map. Scroll in and out to change the scale of the map so that you can see wells in an area. If you have a particular address that you are interested in, enter it including the Zip Code (e.g. 229 Berkeley St, 02116) and click enter. When you can see the well that you want, click on it. The current reading for that well will appear in a flag on the map, with all historical data to the right of the map, listed from newest down to older readings (this is a change from previous BGwT data) and information on the well’s approximate rim elevation measured against Boston City Base (as are all of our elevations) and the well installation date and any applicable notes below the map. On the map for tablet computers this information will be in a separate pop up box that appears as a separate window. Returning to the map, you can click on other wells to see readings in the area around the first well. To navigate to areas beyond the edges of the map, you can click and drag the map to a new location. Another way to reach the data for a particular well is to click on "Well locations". Click on a particular well, and you’ll get a map showing the well, current data on the map, and historic data on the side. A general description of the location of each observation well is shown on the map and listed above the historic elevation data. Plan locations are considered accurate within approximately 5 feet. 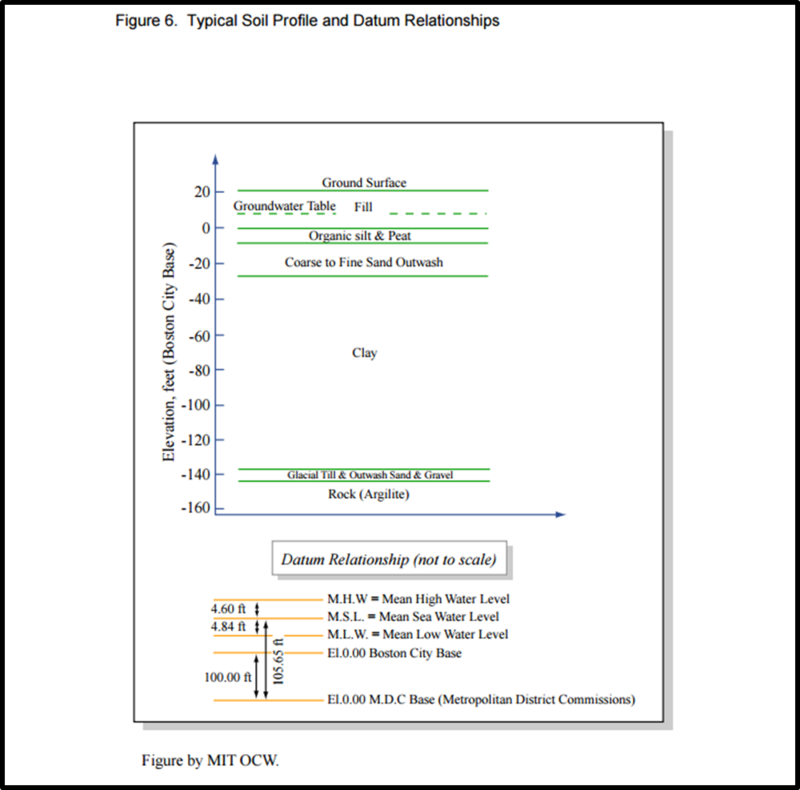 The groundwater elevations are referenced to Boston City Base Datum (BCB) as indicated in the graphic below and were measured by the Trust’s field researchers in each observation well on the dates indicated. Boston City Base is mean low tide level which is elevation 5.65' BCB. For reference, the Charles River is typically maintained between elevation 7.5' and elevation 8.0' BCB. While the majority of the information the Trust has compiled in reference to wood pile cutoff elevations are at elevation 5' BCB there are buildings where that number is higher or lower. Therefore, the groundwater elevations should be at elevation 5' BCB and higher to ensure that the wood pile is submerged and not exposed to air and subsequent rot. While the well data shows the groundwater level at a particular location, the important issue for wood pile preservation is the relationship between the groundwater level and the level of the tops of those wood piles. As indicated in the above graphic, the tops of wood pilings occur in the fill stratum. The higher the piling cutoff elevation, the more vulnerable the pilings are to lowered groundwater. The level of the wood piles that support a house is called the "piling cut-off grade." When wood piles were originally driven, the tops usually ended up at different levels, so to set the granite block pile cap stones, the wood pile tops were all cut to the same level, thus the cut-off grade Wood pile cut-off elevations can vary substantially between neighboring buildings; sometimes there will be more than one cut-off elevation for wood piles within one building. The graphic below highlights the importance of this relationship between groundwater level and cut-off grade. The Boston Groundwater Trust reviews City of Boston records to find wood pile cutoff elevations listed on building permits or other city records. For more information on what we have found and how to use these records, click here. We continue to review City records and will be adding cut-off level data on more addresses as we find it. However, for many rowhouses there is no information available on elevation of wood pile tops. The groundwater level data presented apply to each individual observation well. Groundwater levels may, and often do, vary within relatively short distances, being affected by: leaking tunnels, pipes and basements; buried impermeable structures/walls; infiltration of precipitation on ground surfaces, or the lack thereof due to buildings or pavements; local dry wells that are periodic recharge sources; and local withdrawals of water by pumping from sumps, dewatering wells, or other drainage systems. The Groundwater Trust, in the presentation of this data, makes no engineering assessment or legal interpretation. Groundwater levels can vary from day-to-day and often rise following heavy rainstorms or prolonged periods of precipitation. No attempt has been made to explain or otherwise interpret the groundwater levels and/or variations herein presented. Thank you for your interest in groundwater levels of the study area, within which it is essential to maintain groundwater sufficiently high to keep wood pilings submerged, thereby preventing exposure to air and subsequent wood rot. The data and information accessible on this website is provided "as is" and there may be delays, omissions or inaccuracies in such information and data. The Boston Groundwater Trust, its affiliates, agents and information providers cannot and do not guarantee the accuracy, sequence, completeness, timeliness, or fitness for a particular purpose of the information or data made available through this website. THE BOSTON GROUNDWATER TRUST SHALL NOT BE HELD LIABLE TO ANY PERSON FOR INDIRECT, SPECIAL, PUNITIVE, CONSEQUENTIAL, OR INCIDENTAL LOSS OR DAMAGE. THE BOSTON GROUNDWATER TRUST SHALL NOT BE LIABLE FOR ANY UNAVAILABILITY, INTERRUPTION, DELAY, INCOMPLETENESS, OR INACCURACY OF INFORMATION.